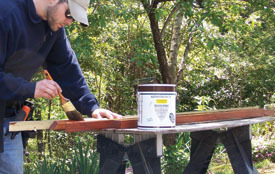 Replacing Worn-out Wood with Low-Maintenance Composites. Decks take a lot of abuse. Due to their very nature, we expect them to withstand brutal attacks from direct sunlight and driving rainwater. And, if not properly preserved and maintained, a wood deck will eventually require a major facelift, as shown in this article. The sundeck we remodeled for this issue of EHT had certainly seen better days, before the wood succumbed to the perils of direct ultraviolet rays. The deck had been slapped with a clear coat of water preservative, but that was the extent of protection. And being situated on the second-story of a townhouse, there were no trees to shade it from that enormous nuclear cannon in the sky that we call the sun. The 2-by decking boards were no match for the power of Mother Nature, and the lumber had checked, warped and grayed. The deck floor was no longer in the same plane, nails were popping like a pan of Orville Redenbacher, and the cap rail had bowed into the shape of a miniature ski slope. 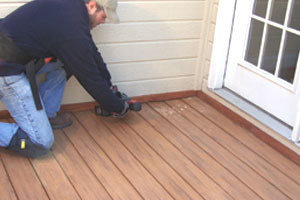 It was time to get out with the old deck boards and in with the new—the “new” being low-maintenance composite decking. The owner of the deck selected Timbertech’s Earthwood brand of composite decking in a “Tropical Teak” color. 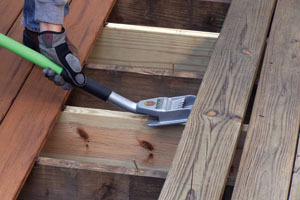 According to the manufacturer’s instructions, the Timbertech boards required the deck joists to span a maximum of 18 inches, but the deck currently existed with joists on 24-inch centers. This meant I had to nail additional 2-by-8’s between the existing joists. 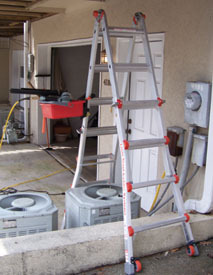 Each side of this Ladder can be independently adjusted for length, so it can bridge uneven footing and obstructions like the curb and HVAC unit shown here. A reliable framing nailer and a sturdy, adjustable ladder came in very handy for this chore, because the framing was roughly 10 feet overhead. The deck was also 10 feet deep. I was working alone on this deck remodel, and that meant balancing the 10-foot joists from atop the ladder, holding them in position and using one hand to toe-nail the ends into the ledger boards. 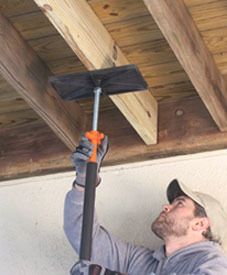 If you’re working under similar conditions, then you’ll find it helpful to secure a bucket to the ladder for holding the nailer. And, I’d suggest wearing a toolbelt that includes a back brace, because this balancing act can do a number on your lower lumbar region. 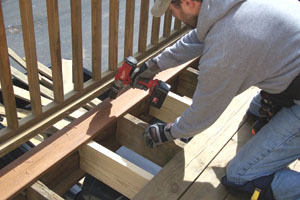 This deck was previously built with a 2-by-2 support strip that ran flush beneath the house side of the joists, and the joists were nailed to the framing and block. 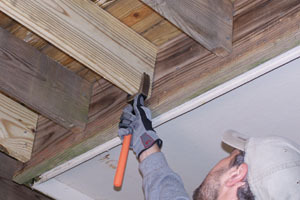 However, a much more structurally sound method to connect joists to the ledger board is to use metal joists hangers at each end. I also had some difficulty positioning the tops of a few joists flush with the existing deck boards, and I needed to make sure the replacement boards would be going down on framing that’s all in the same plane. My solution was to use a T-Jak, which is a type of cabinet jack (or drywall tool … or decking tool, evidently). However, the T-Jak didn’t reach from the concrete carport to the second-story joists above. Since I was working on a Little Giant ladder configured as an A-frame, I bridged a scrap 2-by-8 board across the rungs to serve as support for the bottom of the jack. This worked well; it gave the T-Jak the reach it needed, and I could crank on its adjustment job until the jack pushed the joist in place. Before fastening it, I made the final adjustments to plumb the joist with a special pry bar called the Tweaker from Mayhew Tools, which clutches the 2-by in a hardened steel grip so you can bend it in position. Left: To begin demolition of the decking, I cross-cut the first board with a recip saw. www.boschtools.com Right: Once it was cut, the board pulled up easily with a small pry bar. Ordinarily I would take a beefy pry bar and tear through all the deck boards like a wolf in a hen house, being that tearing stuff down can be a lot more exhilarating than building it up. However, I was working 10 feet from the ground, and decided to take it easy, alternatively tearing up and replacing the decking as I worked my way across to leave myself some sturdy flooring on which to work. I started demolition at the far corner of the deck by plunge-cutting the end plank with a reciprocating saw. Once the board was cross-cut it pulled up easily with a pry bar, and that got things going. 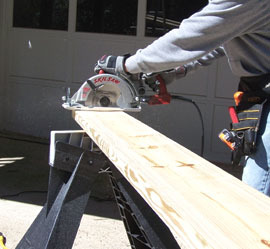 I could then use my favorite deck-destroying tool, the Gutster, to pry up the boards from the joists. The Gutster is a monster of a pry bar—at 48 inches long, it has all-steel construction but weighs less than 10 pounds. The Gutster gives you great reach, great leverage, and its huge demolition head has enough bite to tear up all the heavy framing you can throw at it. And although the Gutster has built-in nail-pullers, much to my dismay the previous deck builder had used headless, smooth-shank nails—hundreds of which failed to pull up with the deck boards. This meant I was stuck pulling nails with pliers—one at a time, up close and personal. Then, the first board was fastened to the framing with square-drive composite decking screws. Once all the old deck boards were out of the way, I had the green light for the composites. The first new board went down beneath the hand rail and flush with the outside edge of the deck. 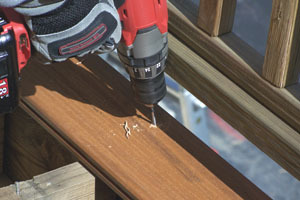 I used a drill/driver to fasten it down with composite decking screws in pilot holes, driven no closer than 1 inch from the edge of the deck board. 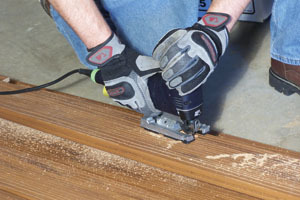 When pre-drilling composite boards, you’ll notice that some shavings of composite material will probably pull out of the hole. I used those composite shavings to cover the countersunk heads of the deck screws—softly tap in the shavings with a hammer; it works like a wood plug. On the inside edge of the board, metal hangers were installed inside the channel at every joist location. Screws were driven at 45 degrees through the center of each hanger, which tightens the hanger to hold the board securely. 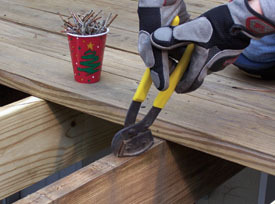 It may help to use a hammer and a scrap of decking to tap the boards together when closing the joints. Basically, I just repeated the installation pattern from one end of the deck to the other; install a new deck board, fasten all the hangers in place, install a new deck board, etc. Once I got on a roll, I made some serious progress. (And here’s a tip on keeping up that progress: Invest in some quality knee pads.) When I got to the house-side of the deck, I had to rip some boards to width, including having to notch one board with a jigsaw to fit around a chimney. 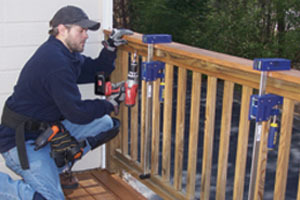 Overall, the Timbertech fasteners proved to be a fairly easy and straightforward method for deck installation. And when the joints closed with no more than about 1/8 inch from board to board, the deck really did achieve a completely “nail-free” appearance with a clean, classy look. Naturally, I ran into a couple of unexpected snags on this project. First, there was no flashing against the house. As a result, there was already evidence of wood rot at the deck intersection. So, I bent some aluminum flashing on a sheet-metal break and installed a channel beneath the siding along the top of the ledger board, to minimize further water damage. You won’t see photos of this step because I bent the flashing off site, and I was frustrated with the extra work so I didn’t fool with the camera. Sue me. The trim was mitered as necessary and fastened along the edge of the deck with decking screws in countersunk pilot holes. Another hang-up came with the discrepancy between the thickness of the deck boards. The old lumber decking was 1-1/2 inches thick. The new composites were only 1 inch thick. When I installed the new boards, they revealed 1/2 inch of unpainted siding along the bottom of the three walls surrounding the deck. To hide this I needed to add trim, and settled on a kind of makeshift base moulding for the deck. 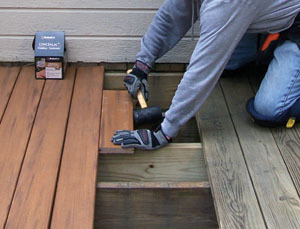 Here, I should interject that the homeowner decided to keep the existing wood handrail system (except the cap rail), with the intention to stain the wood to match the color of the deck. To match the base trim to the railing, I ripped some 2-by-2 trim pieces from 2-by-4’s on my table saw, which would also be stained. I then ripped a bevel along one edge to ease the profile a bit. I used a miter saw to cut them to length and to cut all the 45-degree corners. Granted, base trim for interior applications isn’t typically this bulky, but this was a deck, and I was trying to keep the wood thick and strong to resist warping from exposure. I was also relying on the protection of a high-quality wood preservative. For the wood coating, the homeowner selected a semi-transparent Sierra Redwood stain from Armstrong-Clark. The EHT staff has used Armstrong-Clark’s oil-based preservatives in the past, and they hold up well against water and UV-rays. The wood stain complemented the new composites very nicely, and I predrilled the base trim and screwed it in place along the edges of the walls. We then added a Timbertech fascia board to the outside edge of the deck and stained the handrail. The finished project was a dramatic upgrade to the old, weathered lumber of the previously damaged deck. 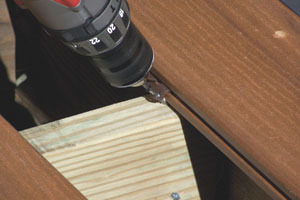 The new deck surface boasted a fresh, warm color and an uninterrupted, blemish-free surface thanks to the hidden fastener system. And just in time for summer.